Washington, D.C. – Today the U.S. Senate Committee on Agriculture, Nutrition and Forestry passed the Agriculture Improvement Act of 2018 (Farm Bill) by a vote of 20 to 1. The Senate Farm Bill continues important energy title programs, including funding for the Rural Energy for America Program (REAP) that provides incentives to farmers, ranchers and rural small businesses for energy efficiency and renewable energy. The committee voted to include an amendment to strengthen energy programs with mandatory funding. Ann Mesnikoff, ELPC’s Federal Legislative Director added “The Senate Farm Bill’s continuation of REAP and the energy title with mandatory funding stands in stark contrast to the failed House bill that eviscerated both the energy title and mandatory funding for REAP and other programs.” The House version of the Farm Bill was defeated by a margin of 198-213 on May 18th. The committee adopted a bipartisan amendment to restore mandatory funding for programs within the energy title consistent with the 2014 Farm Bill. The bipartisan amendment was led by Sen. Amy Klobuchar (D-Minn.) with senators from across the Midwest, including Tina Smith (D-Minn.), Joni Ernst (R-Iowa) and Heidi Heitkamp (D-ND). Washington, D.C. – During consideration of the Farm Bill (The Agriculture and Nutrition Act of 2018), the U.S. House of Representatives overwhelmingly rejected an amendment from Representative Andy Biggs (R-AZ) to repeal the Rural Energy for America Program (REAP) and other Farm Bill Energy Title initiatives by a stunning 82%. The vote was 340 to 74. “This is only a starting point and ELPC will work with members to ensure REAP receives effective mandatory funding in a final bill. Last week, more than 80 organizations from across the country sent a letter to Congress expressing strong support for continuing REAP with reliable funding,“ said Ann Mesnikoff, ELPC’s Federal Legislative Director. REAP provides grants and loan guarantees to agricultural producers and rural small businesses to adopt energy efficiency and renewable energy. The program serves all agricultural sectors and has reached every state. REAP has been highly popular with farmers, ranchers and rural small businesses, with requests regularly exceeding available funds. On May 23, 2017, the White House released their recommended fiscal year 2018 budget, reflecting their priorities and policies for the nation. And the message clearly states they do not support farm-based clean energy production as a way to invest in rural America. This budget would unravel the legislative deal struck in the 2014 Farm Bill. The Trump budget eliminated funding for the most effective programs of the Farm Bill Energy Title. Additionally, for several programs the budget eliminated funding that had been carried forward from previous years, which means they went beyond cutting annual funding to even eliminate residual funds. 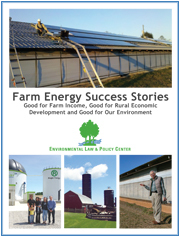 The Rural Energy for America Program (REAP) has supported over 15,000 energy saving and clean energy producing projects in rural areas in every state. The 2014 Farm Bill provided mandatory funding of $50 million per year. The Trump budget would eliminate all of that funding, and also remove $8 million carried forward from previous years, essentially killing REAP. The Biorefinery, Renewable Chemical and Biobased Product Manufacturing Assistance program provides loan guarantees for plants that can use agricultural residues and other forms of biomass to produce a range of energy and non-energy projects. The Trump budget claws back the $175 million in accumulated program funding. The Biomass Crop Assistance Program (BCAP) would be get the same treatment as in previous years – capped at $3 million. A statement from the Chairs of House and Senate Agriculture Committees indicate they will pursue a more independent path on appropriations, though they did not specifically mention energy programs. The following chart provides an over view of changes. Note that the negative numbers mean mandatory funding would be eliminated and reserve funds would be taken away. Mandatory funding — The amount authorized in the five-year Farm Bill by Congress is available unless limited to smaller amounts in the annual appropriations process; if appropriators do not act, the amount that was authorized is provided to the program. Discretionary funding – Programs that require annual funding to be passed by the Appropriations Committees.